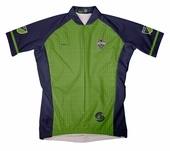 Thanks for visiting CycleGarb.com, your Home for Performance Cycling Apparel, Cycling Jerseys, Shorts, Socks and More. We are always updating our product catalog of Cycling Gear, but some of our most popular manufacturers include Primal Wear, Brainstorm, and 83 Sportswear. If you're searching for a gift for your cycling friends and family then you've come to the right place! Do they listen to classic rock? 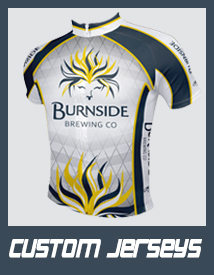 Perhaps they'd enjoy one of our rock cycling jerseys. Were they a member of the armed services? 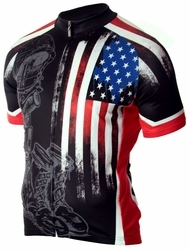 Maybe a military cycling jersey could do the trick! Big collegiate sport fan? Head over to the college cycling gear section! Bit of a drinker? 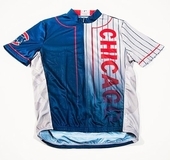 Beer jerseys are great for the rider that reaches for a frosty brew after the race. 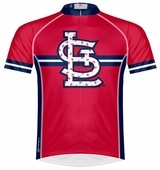 And we don't just carry bike jerseys! We've got cycling socks, arm warmers, bike shorts and more. Last, but not least, don't forget about our FREE SHIPPING for US orders! Happy Shopping!